The Greater Blue Mountains World Heritage Area of New South Wales is a potential refuge area for koalas and many other species, made up of over a million hectares of protected reserves. Historically, the Blue Mountains were a stronghold for koalas, but their status there today is uncertain. We do not know how many koalas occur there, what habitats they use, or the condition of their food trees. Any koalas are likely to be widely spread in low-density populations and difficult to track in challenging mountainous terrain. Researchers from the Australian conservation organization Science for Wildlife have placed GPS radio collars on some of the resident koalas, which is providing valuable information. Additionally, permits are now in place to train koala detection dogs to assist with the surveys. Given that dogs are normally not allowed into Australian national parks, this represents a major vote of support for our work. Fieldwork on koalas in both Brisbane Valley and on St. Bees Island continues with our collaborators at the Queensland University of Technology. 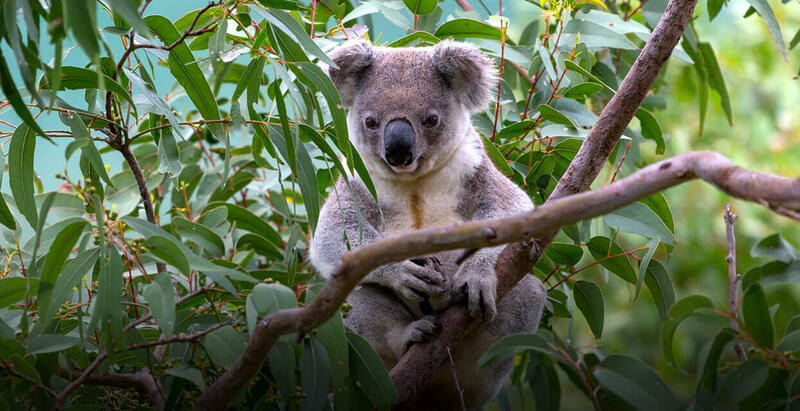 Their research in Brisbane Valley aims to determine how the size and shape of habitat patches affects koala ranging patterns and contributes to habitat connectivity. It is hoped that this work will lead to future land rehabilitation in the Brisbane Valley. On St. Bees Island, work continues with monitoring the local population and studying mate choice, tree use, and other aspects of koala ecology. Our Population Sustainability scientists are in the final phase of a three-year collaborative study that is examining the genetics of the koala across its entire native home range from North Queensland to Victoria. The results from this study will provide a comprehensive analysis that will assist conservation managers with the genetic management of wild koala populations, especially as they become increasingly isolated by development. San Diego Zoo Global maintains the largest koala population outside Australia and reaches a global public through exhibition, education, and research. We continue to gain key information from our breeding colony that supplies data on genetics, mate choice, vocal and scent communication, and health. The program generates funding to support research and conservation initiatives ranging from habitat mapping to studying koala biology in collaboration with our partners. There is a strong element of conservation education and outreach to the program, which has been in place for more than 30 years. For many years I have easily been able to spot a radio tracked koala, how? By the telltale sign of a collar around its neck. But technology is changing and so is how we are tracking koalas in Australia.